Columbia, Mo. (May 9, 2018) — Four Missouri School of Journalism students are among the 82 undergraduate and graduate students who have won a nationwide competition for prestigious Dow Jones News Fund (DJNF) data and business internships for this summer. They will work as data and digital journalists, business reporters and multiplatform editors in paid internships at 63 of the nation’s leading news organizations. The News Fund received more than 730 applications last fall. 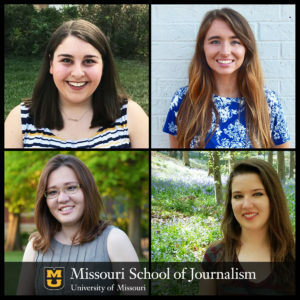 Missouri Journalism recipients of the prestigious Dow Jones News Fund internships are (clockwise from top-left) seniors Nancy Coleman, Kathryn Hardison, Tess Vrbin and alumna Dariya Tsyrenzhapova, BJ ’10, MA ’18. Nancy Coleman, a senior from Johns Creek, Georgia, will attend the Centers for Editing Excellence at Temple University before beginning her internship at The Wall Street Journal. Kathryn Hardison, a senior from Springfield, Missouri, and Tess Vrbin, a senior from Loves Park, Illinois, will participate in the Digital Media Program at Arizona State. Hardison will complete her internship at Storyful; Tess Vrbin, The Kansas City Star. Alumna Dariya Tsyrenzhapova, BJ ’10, MA ’18, from Almaty, Kazakhstan, will attend the Data Journalism Program at the Missouri School of Journalism. She will complete her internship at the Investigative Reporting Workshop. “I’ve known alums who said that Dow Jones internships really changed the course of their journalism career, so I’m excited to see what happens for Kathryn, Nancy, Tess and Dariya,” Johnston said. The summer internship program begins with a one-week training program before students report to work for a minimum 10 weeks. Those returning to college will receive $1,000 scholarships. Investigative Reporters and Editors, headquartered at the Missouri School of Journalism, will be the training site for the data journalism interns. These students will receive training in obtaining and analyzing data, visualizing information and employ other computer-assisted reporting methods. The students will receive their pre-internship residence training at the School May 29 to June 3. This is the third year in a row that Missouri has served as the training site for data journalism. The News Fund was founded in 1958 to improve the quality of journalism education and improve job applicants in the news business. Summer internships began in 1960. One of the most recognized programs in the world, DJNF regularly selects Missouri journalism students along with the best and brightest future journalists in the country.